A few miles north-west of Nottingham, in the English East Midlands, Southwell is neither on a major route to anywhere, nor in traditional tourist-land. So, for most people, going there is a premeditated act; it took me years to get round to it. To help with your own decision, and before we get on to Southwell Minster, let me say that this attractive town is the birthplace of the Bramley apple, where King Charles I spent his last night of freedom before surrendering to the Scots, has its very own workhouse and Byron, the poet, used to spend his vacations there, with his mother. Moreover, it can’t decide whether it’s Suthell or South-Well, so you can already see that Southwell is a place to be reckoned with. Southwell Minster is the Cathedral Church of Nottinghamshire and, somehow, it manages to combine an almost homely ambience with stately magnificence. It doesn’t shout about its stories and treasures, though it has plenty of both. 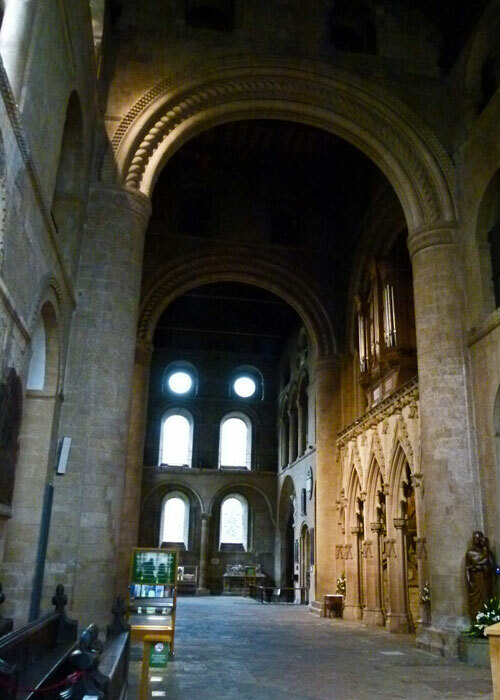 It boasts (though not too loudly) famous pepperpot towers, astonishingly ornate, lifelike, carvings known as the leaves of Southwell, a fusion of Romanesque, Norman, architecture with English Gothic, intriguing stained glass, a 10th or 11th century tympanum (carved lintel) and so much more. Next door is the largely ruined palace of the Archbishop of York, refurbished by none other than Henry’s pre-Reformation henchman, Cardinal Wolsey. According to legend, the first church on the site of Southwell Minster was Saxon, founded in 627AD by Paulinus, the very first Bishop of York. But the very first occupants appear to have been the Romans, because under the Minster site, and beyond, are the remains of a large Roman villa, which appears to have been modified and rebuilt over a 400-year period. There is a suggestion of a temple, too. It is almost impossible, but fun, to imagine how the place would have looked when inhabited by wealthy Romans – who would obviously have chosen a pleasant spot to build their home. It is pure speculation, but if there was a temple on the site I wonder if it was purloined by early Christians, or whether they built a church next door; this was not uncommon and it would be diverting to think there had been continuity of worship for even longer than we know, even if the religions have changed somewhat over the years. There are relics of the Romans in the Minster itself. A panel of painted plaster, excavated from the bath-house of the villa, is displayed inside, on the wall of the south quire aisle. Pieces of Roman mosaic, trodden by sandaled feet almost two thousand years ago and reused by Saxon builders, can be seen under 15th century bread pews, dedicated to the poor and destitute who could received food and, perhaps, money there. Onto the history we can be reasonably sure of. In 956AD, King Eadwig (or Edwy) of the House of Wessex granted the land to the Archbishop of York, Oskytel, and a collegiate church was developed. A collegiate church is similar to a cathedral, but is not a bishop’s see and not a monastery dedicated to a particular clerical order. 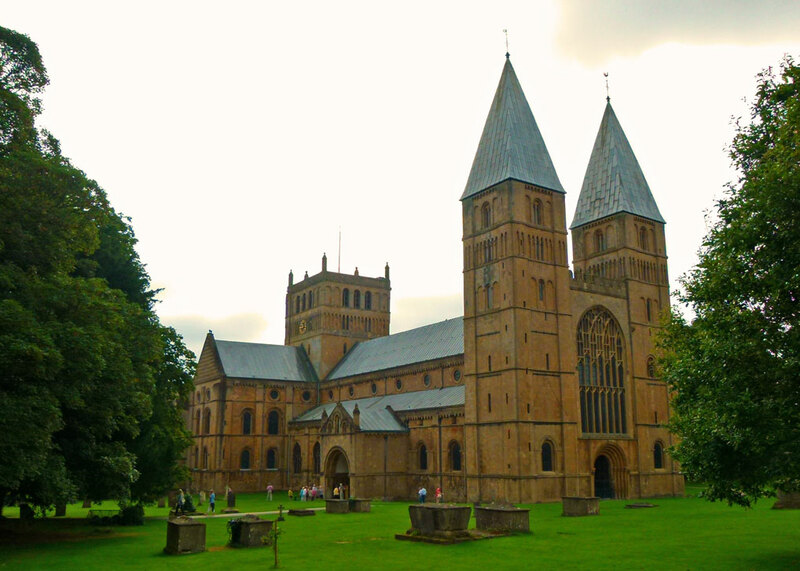 Just prior to the conquest, Southwell Minster was the mother church of the southern part of the diocese of York, with onsite accommodation for priests in a hall, and a refectory. In 1108, Thomas, Archbishop of York, commissioned the rebuilding of the Anglo-Saxon church as a kind of sub-cathedral to York (along with Beverley and Ripon) and the arches below the central tower, or crossing, are relics of this period. The pepperpot towers were completed by 1170, and lasted until 1815 before being declared unsafe, and removed; the current ones are late 19th century replacements. The elegant quire dates from the 13th century and the stunning octagonal Chapter House is 14th century. 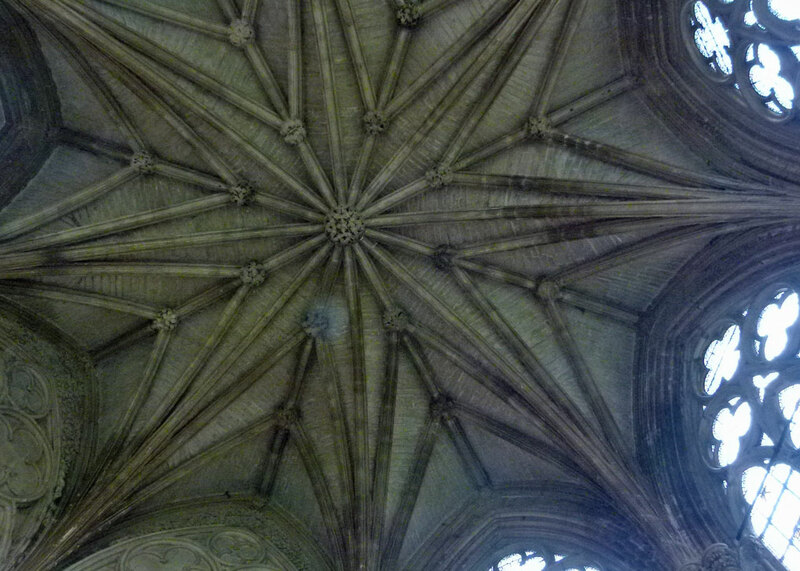 The Chapter House is simply exquisite, with an astonishing unsupported roof, and is justly renowned for its fabulous carvings of different leaves – which would have been found in the adjacent Sherwood Forest – animals – some real, some imagined – human heads and Green Men – pre-Christian symbols of fertility and re-birth, with branches and vines emerging from their mouths. Architectural historian Nikolaus Pevsner published a book, ‘The Leaves of Southwell’, in 1945, with photographs by Frederick Levi Attenborough, father of Sir Richard and Sir David. 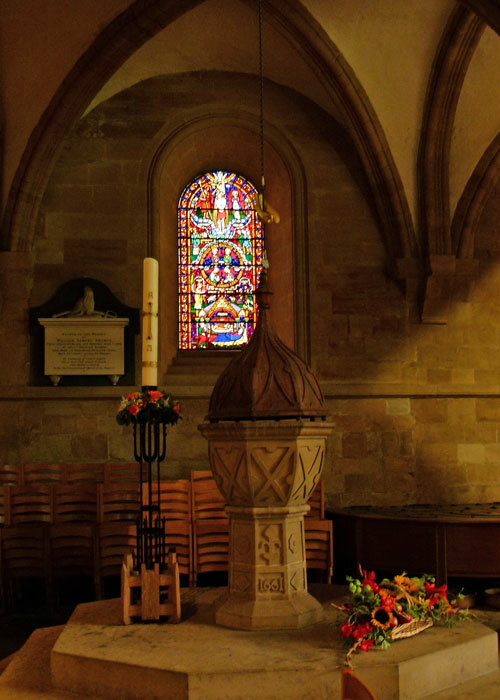 Southwell Minster claims to have come through the Reformation relatively unscathed, though idols, altars, decoration and other signs of the banned Catholic faith were removed and the young Edward VI sized some of its lands. 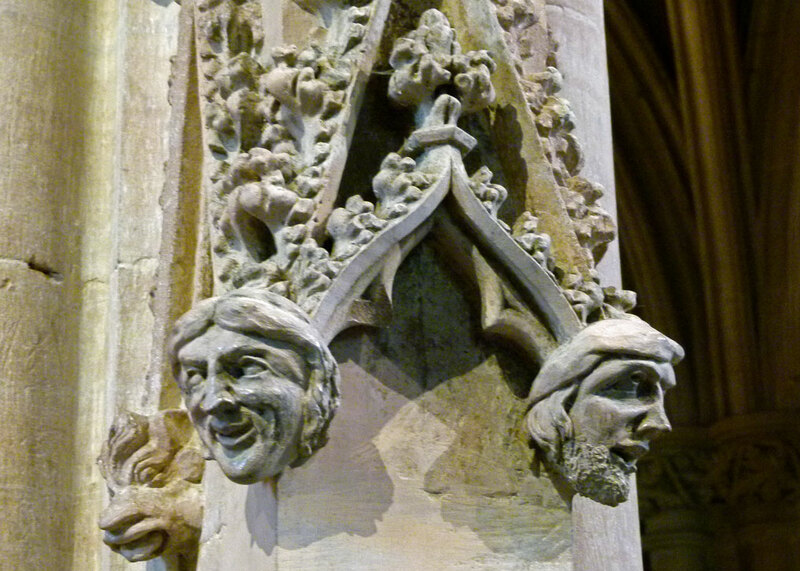 However, the building was damaged by Parliamentary forces during the Civil War, who used it to stable their horses, smashed some of the carvings on the 14th century pulpitum, or quire screen and, allegedly, even looked in graves for valuables. I do wonder how many of these tales of wicked Roundheads were Royalist propaganda, but there you go. Anyway, even greater disaster struck in 1711 (appropriately on 5th November), when a fire destroyed the roof, bells and organ. It took until the late 19th century for the damage to be made good. 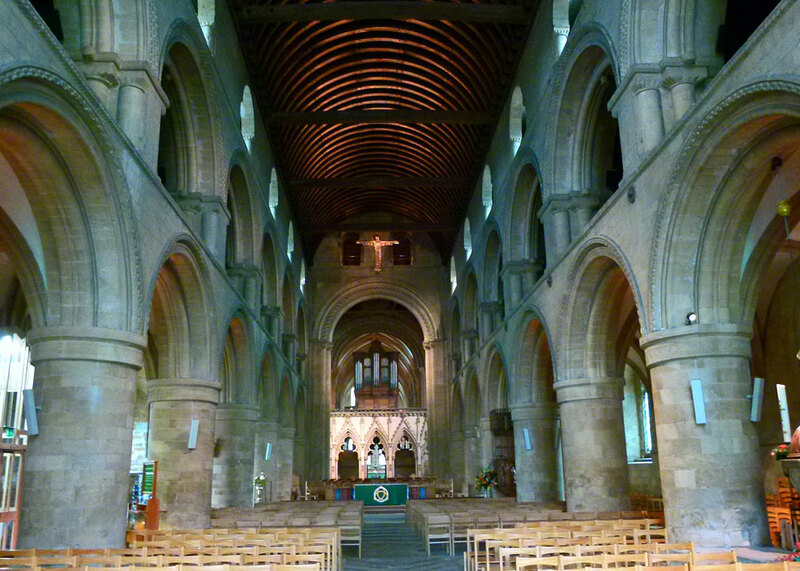 In 1884, Southwell Minster became the cathedral church for the Diocese of Southwell and Nottingham. You enter Southwell Minster through the north porch, above which is what is called a parvis room, where a watchman would have lodged. If you look carefully, you can see a chimney poking through the roof. In the nave is what the Minster authorities call the new font; it dates from 1661, the previous one having disappeared in the Civil War. I suppose it might have been over-ornate and therefore destroyed by religious zealots; but I like to imagine it sitting, in pride of place, in the home of some Puritan, perhaps with flowers in it and, on high days and holidays, used as a punchbowl. 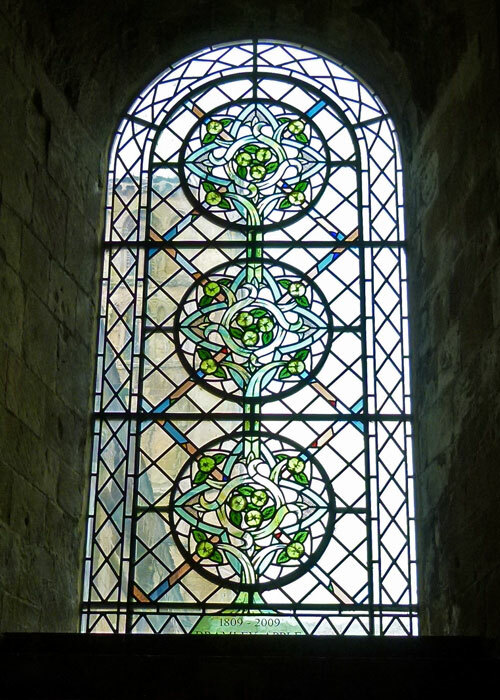 The enormous west window is 15th century, but the glass is more recent. It was designed and painted by Patrick Reyntiens, who described it as “a great gathering of angels enjoying being with God; just all joy and worship.” Made in York and installed in 1996, it is known as the Angel window. Along the soaring Norman nave – said to be one of the finest in England, and I can believe it – to the crossing and you’re confronted by the afore-mentioned pulpitum; it is magnificent. In the quire is a brass eagle lectern. It looks pretty much like any other brass eagle lectern to a layman like me. But this one originally belonged to nearby Newstead Abbey and was made in 1509 in Tournai (now in Belgium). The monks of Newstead hid their title deeds inside the globe under the eagle’s feet and threw the lectern into a pond to prevent the deeds falling into the hands of Henry VIII’s greedy commissioners. Their gesture made little difference, of course. Anyway, the lake was drained in the 18th century, the lectern uncovered and rescued and the deeds were discovered during restoration work. The Minster acquired the lectern via an auction in 1805. 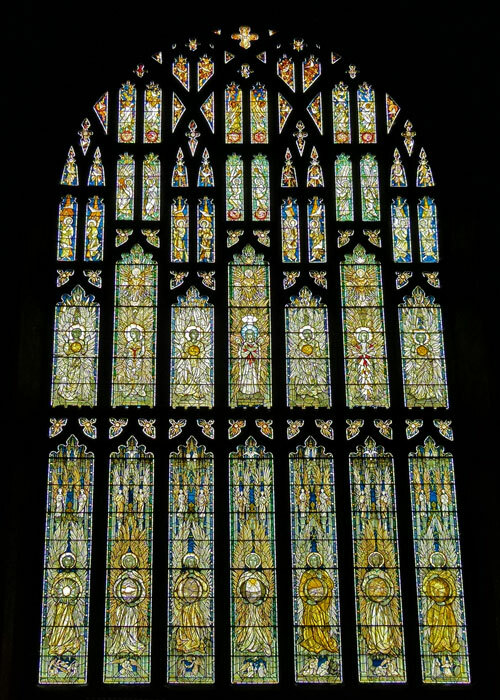 Looking to the east window, the four lower ones were made in 1528 for the Temple Church in Paris. Each window depicts a scene from the life of Christ. Napoleon had the entire Temple complex demolished in 1808 and the windows somehow ended up in a pawn shop, from which they were retrieved and presented to the Minster. To the left of the altar is the Airmen’s Chapel, with an altar fashioned from the wood of propeller blades recovered from the First World War battlefields of the Western Front. There is also a memorial to the Katyn Forest Massacre, commemorating the Polish civilians and servicemen murdered by the KGB in 1940. Nottinghamshire has a large Polish community. The treasure on the north transept is the old lintel, or tympanum. It has come from elsewhere and could have been part of the old Saxon Minster. The carving on the front is 11th century and generally thought to be of St Michael fighting the dragon, though some believe it is meant to be Christ descending into Hades to save mankind. But underneath the lintel is an older carving, looking vaguely Celtic, which might have been a grave marker. Intriguing. Nearby is a modern Bramley Apple window, celebrating Southwell’s association with the best fruit pies and crumbles. 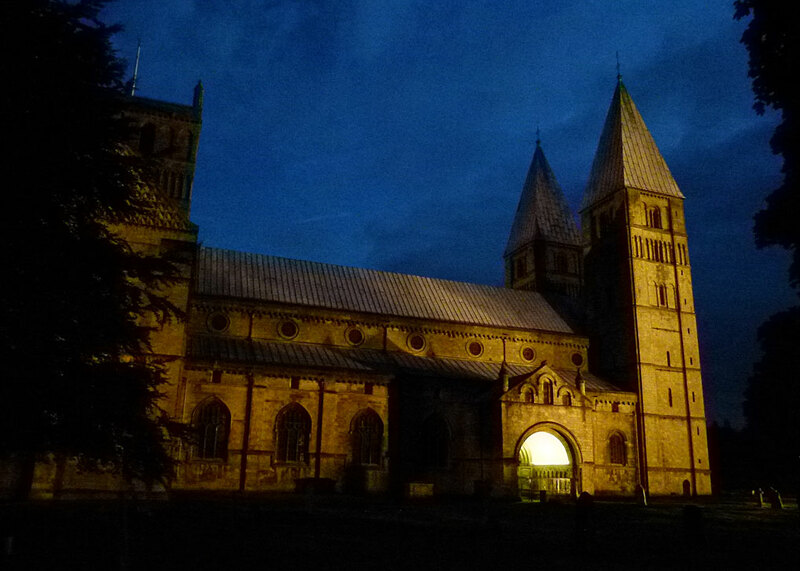 A brief account cannot do full credit to Southwell Minster. We spent hours there and, frankly, it’s hard not to. And I’d happily go back. 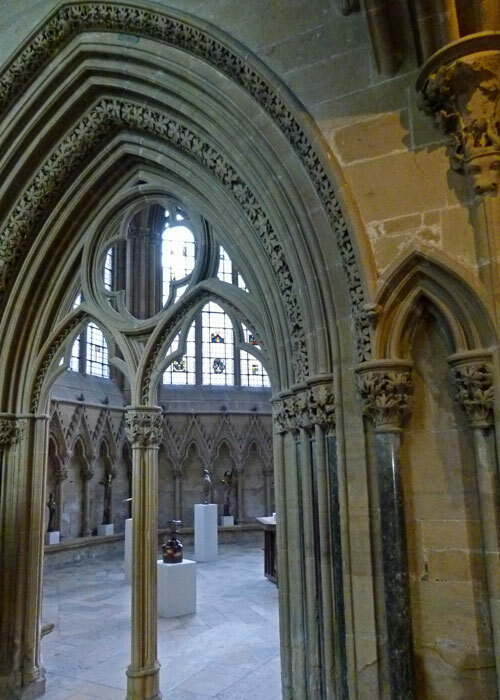 For one thing, there was an exhibition of modern sculptures in the Chapter House during our visit, grotesque child-like parodies of human figures, which detracted from the medieval art of the building for me – and made photography difficult. 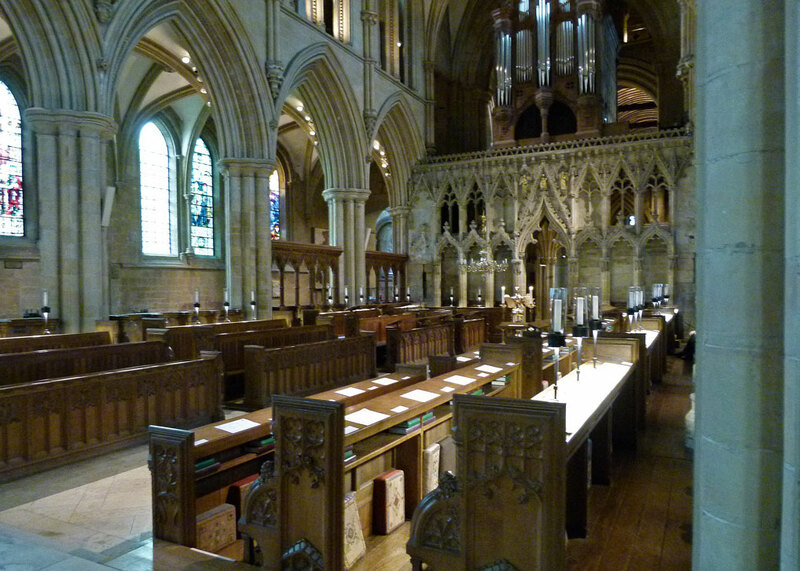 The Minster also has a historic library which has items from the 14th century and which can be visited by appointment. 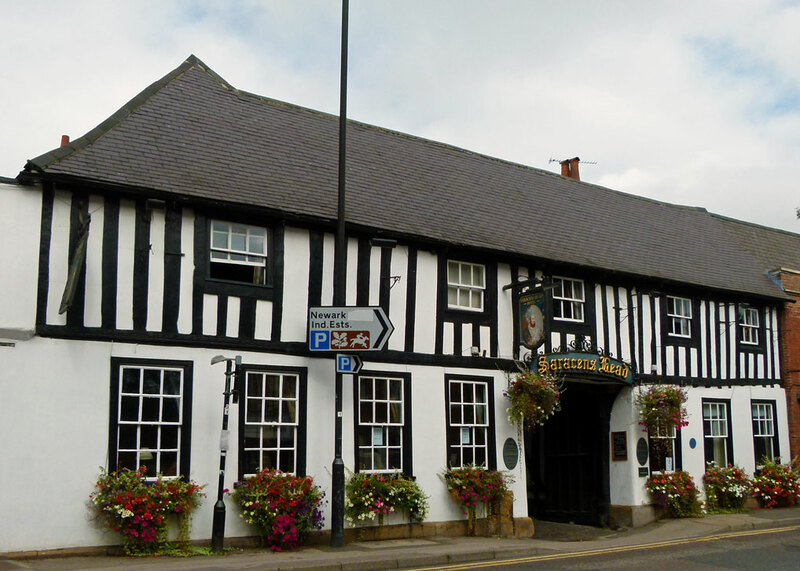 I’ll leave you with a shot of the Saracen’s Head, just down the road from the Minster. Shame about the lamp-post. Previously the King’s Head, this is where King Charles I stayed before giving himself up in May 1647. It was apparently renamed when England flirted briefly with republicanism, presumably because any association with royalty was considered bad form; or perhaps, after Charles’ execution, the name was considered to be in poor taste. Gorgeous shots of this timeless architecture! So elegant. And thank you so much for this post. I have a special interest, and it involves a family mystery. My 3x great grandfather Robert Fox (Hathersage tenant farmer on the Highlow estate) married an unknown ‘lady’ Mary Ann Williamson here by marriage bond in 1812. All I know of her comes from Sheffield’s great rambler GBH Ward who wrote an article about the Foxes of Callow in the 1930s Clarion Magazine. It was thought she was ‘a London lady’, perhaps jilted or or the illegitimate daughter of some wealthy father, who somehow got herself enamoured of Robert the famous local fist fighter. Extraordinary to think of them marrying in such a monumentally grand setting. What a little gem. I’m particularly taken by the Angel Window. I might see if I can work in a visit on my next trip to Yorkshire. This was one compelling invitation, Mike. I can imagine myself there standing on centuries of history from Roman times forward. I always chuckle when I read about the church having been constructed next to the temple of some other god or goddess. Human nature to cover all contingencies. Better safe than sorry as my grandmother always said. The leaves are beautiful and I’m fascinated how they also combine the ancient beliefs inside the “newer” one. These and those stained glass windows are a must see in person. This church is so astonishing, Mike! 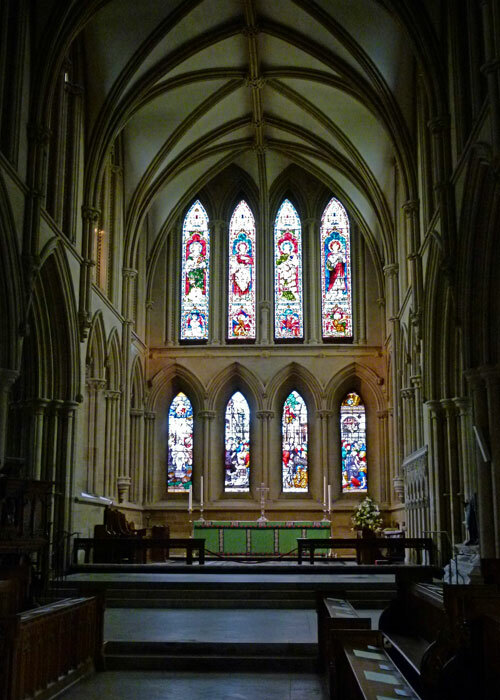 I would love to visit the Southwell Minster. The architecture has left me speechless! Thank you, Agness; and thank you for popping in! The building is beautiful and I loved seeing the different part of its constructions with older parts and more recent ones (I mean Gothic-recent). Now I have a stupid question: why isn’t the apple called Southwell apple? Because they once grew in Mr Bramley’s garden – but there’s a whole history there, which I should cover! Just from your pictures I can see what you mean by the homely ambiance and stately magnificence. What a beautiful building! 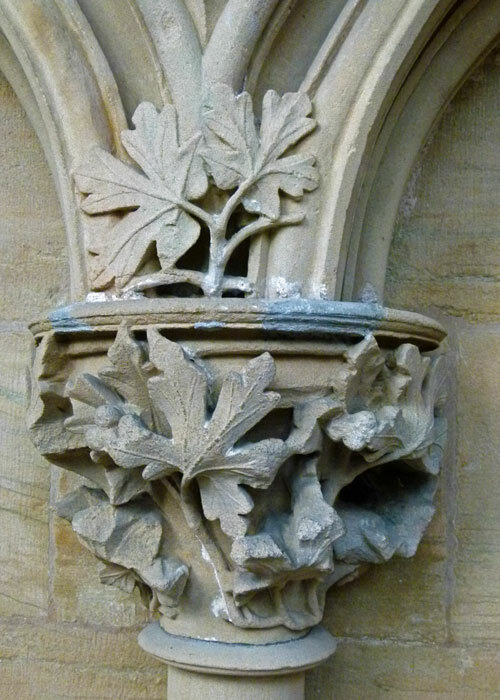 The carved leaves! The stained glass angels and apples! I love this post. The chairs seem odd to me, rather than pews. Were pews considered too Catholic? They must have been there at one time. But the outside of the building – it’s very appealing somehow. Pews are a relatively recent thing – they seem to have became popular after the Reformation and are now very common in all churches over here. But originally people stood, or knelt; or knelt and stood – etc… Many cathedrals don’t have fixed seating over here – that must be far more flexible for them, too, so they can adjust for different events – and even filming, I guess. I would have been intrigued to have seen these old churches before the Reformation, when they would have been a mass of colour! I was brought up in the area and my great aunt had a flat that overlooked the Minster,so i;m fond of it. You got some excellent photos and its nice to read the potted history. I like the town itself too – and the Workhouse is very interesting, if you get chance to visit there. Hi Mike – gosh how very interesting … fascinating sets of information here and I can quite believe you spent a fair amount of time there. I occasionally go to the Newark area so when I’m back I will make a point of visiting Southwell. Some may think I’m heading that way anyway, Mac..! The remark about the Roundheads looking for treasure in graves may well be true; church silver was often hidden under the church floor and odd items, missed by the Puritans and forgotten afterwards, still turn up occasionally when building work is carried out. There seems to be a misfit between the rather plain exterior and the exquisite carving found within. An interesting building that I shall endeavour to see if I’m ever nearby. What a striking church! Something about the outside architecture just seems unusual to me, rather stark, but those interior carvings are amazing, as is some of that stained glass. Sounds like one of the more intriguing places to visit. That was a fascinating post…not just such beautiful photographs but all he research you have done. I enjoyed it very much. I realise you are discussing important religious architecture here, but I need to focus on the pub for a moment. I agree that calling a pub The King’s Head after a royal execution would be in very bad taste. But lopping off the heads of Saracens (Muslims) is in even worse taste. Thanks for the visit. Definitely would be worth s visit. What a lovely church and your writings about it are so interesting. Thanks for sharing. I am an American who visited England last year. I only wish I could have visited here. I enjoy all your entries. Thank you, Marge! Hope I can help if you visit again.